The Italian soprano, Mariella Devia, has become something of an icon; at the age of 68 still singing demanding repertory including Bellini's Norma and Donizetti's Tudor queens. 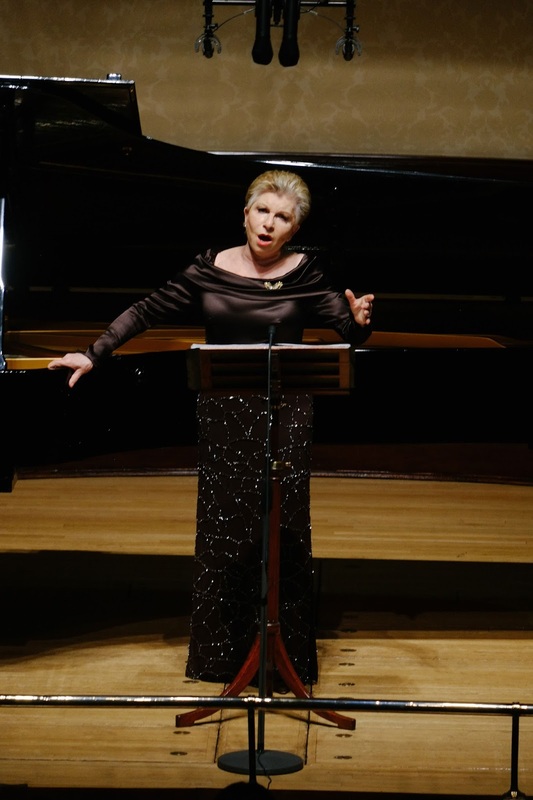 That she has not sung at Covent Garden since 2000 meant that her Rosenblatt Recital at the Wigmore Hall on Tuesday 14 June 2016 was highly anticipated. Accompanied by the pianist Giulio Zappa, she performed Ravel's Cinq melodies populaire grecques, Liszt's Oh! quand je dors and Tre sonetti di Petrarca, Massenet's Adieu, notre petite table from Manon, Gounod's Je veux vivre from Romeo e Juliette, two Verdi songs, Perduta ho la pace and Deh, pietoso, oh Addolorata, plus Sempre all'alba from Giovanna d'Arco, and four of Bellini's ariettes. The recital was supposed to end with Casta Diva from Bellini's Norma, but at the interval Devia was announced as being a little unwell, and after the last Bellini ariette it was announced that she would sing no more, thus giving the evening a somewhat inconclusive feel. In Ravel's Cinq melodies populaire grecques Mariella Devia displayed a remarkably ageless technique with a remarkably strong middle voice. Le réveil de la mariée captured the exotic tone of the song, whilst Là bas, vers l'église was rather affecting with a lovely attention to the colouring of words, though it had become apparent that very few of the words themselves came over. Quel galant m'est comparable was vividly characterful, Chanson des cueilleuse de lentisque started with jut a thread of sound and a lovely sense of fluid line. And the cycle ended with the delightful Tout gai! Liszt's 1849 song Oh! quand je dors, setting Victor Hugo, was sung with a fine seductive line, and a lovely floated high ending. Next came Liszt's Tre sonetti di Petrarca sung in his later version, rather than the first version for tenor and piano. Benedetto sia 'l giorno was quite lightly sung, with a lively sense of colouration to the text and some lovely floated high notes. But even in Italian, few words were audible, and the performance lacked the passionate intensity that I want in these works. Pace non trovo again had a finely spun line, sung with elegance, whilst I'vidi in terra angelici costumi was sung with a seductive line. For all the formidable technique which Devia exhibited in these songs, the overall feeling was of elegance and poise rather than intense passion, and the occluded diction robbed us of Petrarch's poetry. In style, Devia's voice suited the French repertoire, and her account of Massenet's Adieu, notre petite table from Manon very touching. And Je veux vivre from Gounod's Romeo e Juliette combined a sense of style, with spectacular technique and joie de vivre. After the interval we heard a pair of Verdi songs, both written in 1838 and setting Italian translations of Goethe. Perduta ho la pace was sung quite lightly, Devia brought out the hints of early Verdi operas in the work. Deh, pietoso, oh Addolorata was beautifully plangent. Lightness and elegance were again in evidence in Sempre all'alba from Verdi's 1845 opera Giovanna d'Arco. The programme concluded with four of Bellini's ariette, published in 1829. These were beautifully done, with admirable technique and great style though occasionally the performance did not seem to quite match the passion of the words. But for me these songs are very much Bellini-lite; written for the amateur market they lack the intense combination of poetry and music which we expect from the operas.